All Payment Settlement Entities, including HouseCall Pro, are required by the IRS to report the earnings of those merchants who qualify for a 1099-K.
Do I Qualify for a 1099-K? These reporting thresholds are based on the aggregate gross sales volume processed on all accounts that use the same Tax Identification Number (TIN). These thresholds are based on credit card transactions processed through HouseCall Pro and do not apply to other tender types. If you qualify, we will mail you a copy of your 1099-K form to the business address associated with your HouseCall Pro account. What if I Don't Qualify for a 1099-K? If you do not qualify for a 1099-K but still need to download a list of your invoices, you can go to your Jobs list or simply click Here. You can click export and all of your jobs and invoices will be exported into a CSV file that will be emailed to you. You can use and filter this file as best fits your needs. The IRS requires that Payment Settlement Entities, such as HouseCall Pro, report the payment volume received by U.S. account holders. 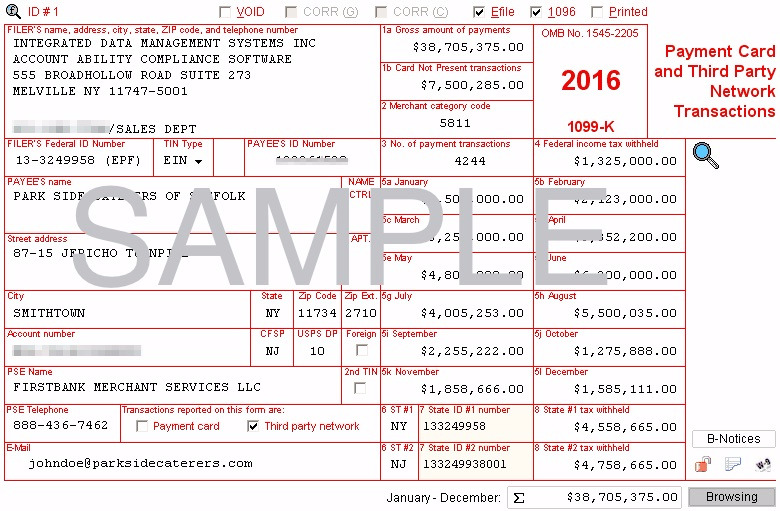 A 1099-K is a compilation of information that is given to the IRS and qualifying customers. Below is an example of what your form will look like when you receive it in the mail. How can I get my 1099-K form? If you qualify for a 1099-K, you will receive your form in the mail. If after January 31st you have still not received your 1099-K form and you qualify for one, please contact our Customer Success department. How are the amounts on the form calculated? The amount and transaction count on each form is calculated based on your gross sales from credit cards on the transaction date of the sales. Because of this requirement, the amount shown on this form will be different from the amount settled into your bank account. This is because you may have had refunds, chargebacks or holds, and credit card processing fees were deducted before funds were deposited to your bank. How do I submit my Form 1099-K? HouseCall Pro is required by law to file a copy of your form for the applicable tax year. You should seek the advice of a tax professional with regards to questions about how to file your taxes, HouseCall Pro cannot provide tax advice.